Started off at home @ 12:01 with the Mongo (22 oz). Stayed up for about an hour after finishing the beast and then went to bed. At lunch today, went to the golf course and hit a bucket of balls while drinking a Racer 5 (12 oz). After work had a Lagunitas IPA (12 oz) with Kevin and Scott. At home again, after dinner, had the Just Outstanding (22 oz). Okay, so this is going to be a scattered review, mainly because it wasn’t really the side-by-side tasting I had planned. But anyway, here’s my beer soaked thoughts. Lagunitas IPA – It’s hard to give these guys an impartial review because I used to work up in Petaluma and shared a parking lot with these guys. So I have very fond memories of walking over to their warehouse after work for their monthly parties and paying $5 for a glass which got me unlimited tastes of whatever they had on tap. So having said that, you may think my 4 cap rating is biased, and it is, so taste it for yourself. Just Outstanding IPA – Now this one caught me by surprise because it wasn’t on my original IPA Day menu. I had gone to one of my secret spots, Farmer’s Harvest, to shop for IPA day in hopes of scoring a Pliny the Elder. Mike saw me scanning the beer wall and asked if he could help. When I told him what I was shopping for he apologized and informed me that they they sold all their Pliny within two hours of receiving their shipment. So I asked him for a recommendation and he said that he had something in the back that I might like. He disappeared into the back of the store and came back with the Kern River Brewing Co – Just Outstanding IPA. I am glad he did. 5 caps, that’s right 5. 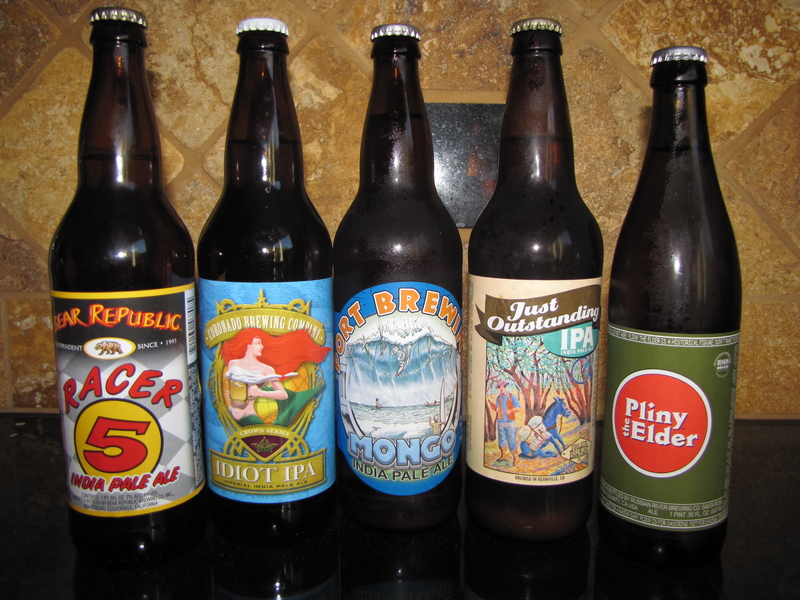 So although I didn’t finish the day with the Pliny the Elder as planned, I still finished with a terrific IPA. And thanks to Ken over at Pacific Park Market I have Pliny in the fridge to enjoy this weekend. This entry was posted in Craft Brew, Double, Imperial, IPA, Review, Tasting and tagged Bear Republic, India Pale Ale, IPA, IPA Day, Just Outstanding, Kern River Brewing, Lagunitas, Mongo, Port Brewing, Racer 5, reviews by Erik. Bookmark the permalink. I am impressed! Not just with the beers (which by the way sound delicious), but also the inspiration behind each of these beers! Kudos man!